This issue's article was written by Shweta Sharma. New Delhi, June 7: Even as Delhi University is seriously looking at ways to make its mathematics curriculum interesting, one of the university's colleges seems to have taken a lead. Gargi College in South Campus has introduced an add-on course in Vedic Mathematics for the academic year 2007-08 with a view to make maths fun for students. The one-year course will incorporate the ancient and time-tested formula of mathematical knowledge to make the subject interesting. The concept of Vedic maths, which is widely being used in classrooms across the country, offers a general multiplication method that allows one-line divisions and one-line square roots. This unifying quality, experts feel, makes mathematics easy and encourages innovation. By introducing the course, Gargi College will be the first college in DU to offer the course. The college is aiming at helping students, especially ones preparing for CAT and banking exams, solve maths quickly. "As we come across many students who aspire to crack the CAT and Banking Sector Entrances, we believe that such a course will help students speed up their calculations and help them solve equations in a much lesser time than expected," said Dr Promila Kumar, coordinator for the course. The simplicity of Vedic Mathematics means that calculations can be carried out mentally (though the methods can also be written down). Pupils of the subject can invent their own methods rather than being limited to the one 'correct' method. The classes for the course will be held once a week for two hours. While course will be open to all students who have enrolled themselves in the college, the admission will be carried out on first-come-first-served basis. "The college is trying to also rope in guest faculty lecturers who are teachers at good institutions that prepare the students for various entrance examinations," Dr Kumar said. Gargi's move highlights a recent trend shaping up in the higher education sector where universities are laying emphasis on holistic methods to impart additional education by way of add-on courses in order to make the curriculum more interactive and innovative. In this post we highlight the Powerful Applications of Vedic Mathematics in the field of Information Technology. We bring to light for the first time the works and papers of students who have used Vedic Math in fields of Digital Signal Processing (DSP), Chip Designing, Discrete Fourier Transform (DFT), High Speed Low Power VLSI Arithmetic and Algorithms,RSA Encryption System etc. All the papers presented here on various IT topics have used the Vedic Math Methods such as Multiplication, Division, Squares, Cubes. Some even claim to have used Geometry and Calculus in their programming structure. 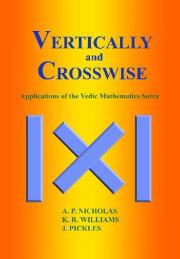 Vedic Mathematics for all Ages - A Beginners Guide by Vandana Singhal from Pune. (Published by Motilal Banarsidass, Delhi). We have not seen this book but have received good reports about it. Sujaritha has been giving Vedic Maths lessons in Chennai, India for many years and she has now moved to Al Wadi Kabir,Muscat, Sultanate of Oman where she will be starting up Vedic Maths classes. Her cell no. is 0096895483862. You can also email her at: Visit her blog at http://vedic-maths.blogspot.com/ . This Bookstore now has a full shopping cart facility so you can shop there easily for Vedic Maths books using your credit card. I have to tell you that I am currently in Hyderabad in India. Yesterday I was walking through the back streets of Secunderbad and I found a really old looking book shop full of dust and mischief, so I had to have a look. Over to the left hand side was a very dark and damp smelling section saying ' Education '. So I went over to have a nose and after about half an hour I saw a red book which had a deep coating of dust saying "Discover Vedic Maths" so I picked it up and saw that the author was you. Funny that the books that I can't get in the UK I find in the back streets of Secunderbad. I just saw your web site after seeing an article in the Orlando Sentinel about a math tutoring center opening in Lake Mary called "Math Monkey". It said it used Vedic's math so I went to wikipedia and did some research. I went to a math tutorial and in minutes I had taught myself and my 62 year old mother the first tutorial. I am amazed. I am a fourth grade teacher and very excited about teaching this to my students. I want to learn as much as possible. As you can see from the time of my email I am up late doing math! Too funny huh? Thank you for this site it is great.